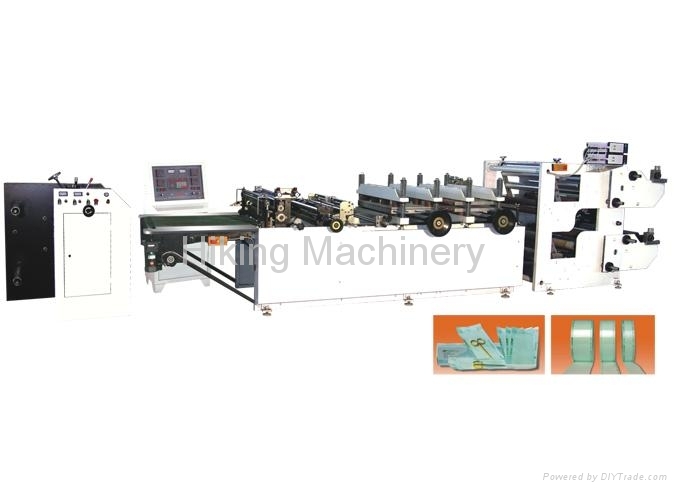 This machine is especially for making medical pouch and tube, using paper and heat-sealing plastic film. Heat-sealing is through shaped die set (more die sets can be made) and through vertical cutting, edge cutting and cross cutting. With frequency conversion speed regulation, three-position level material feeding and automatically controlled tension, the machine is suitable for making sterilizing package of medical appliances. It can make dotted line, punch, and add adhesive tape to pouches. It is provided with up and down heat-sealing, and cooling stations. Adopting micro-computer control system, it is easy in length setting and has the functions of figure displaying, automatic alarming when reaching the set value. With a high-accuracy stepper motor and driver, it is easy to make the material transmission more steady, accurate and speedy.